I remember thrilling, as a kid, to the envelope illustrations that the magazines I read ran on their letters pages. Not only would some of these readers (usually readers my age, with a lot of time on their hands) go to the trouble of writing and mailing a physical letter to their periodical of choice, they'd actually get as artistic as possible with the envelope as well. Some even did pretty impressive jobs, though as the envelope-illustrators of our time go, few rank up there with the likes of Maurice Sendak. "This is how Maurice Sendak sometimes sent his letters," wrote Letters of Note, tweeting out the image above. "Just imagine getting one." 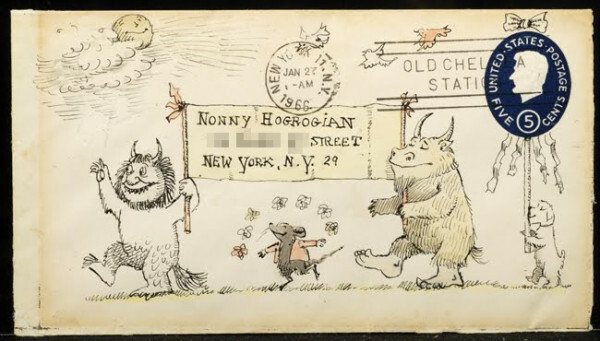 The author of Where the Wild Things Are and In the Night Kitchen wrote the letter contained in this particular envelope to his fellow children's book writer-illustrator Nonny Hogrogian, author of One Fine Day and The Contest . Sendak's close colleagues might have got used to receiving such unconventionally illuminated correspondence, but he also wrote back to each and every one of his young readers, sometimes with similarly prepared correspondence. Letters of Note also tweeted a quote from a Fresh Air interview with Sendak in which Terry Gross asked for his favorite comments from his fans. Sendak told the story of a boy from whom he received "a charming card with a little drawing. I loved it." In reply, he sent the child a postcard of appreciation and drew a Wild Thing on it, just as he did on the envelope of his letter to Hogrogian. 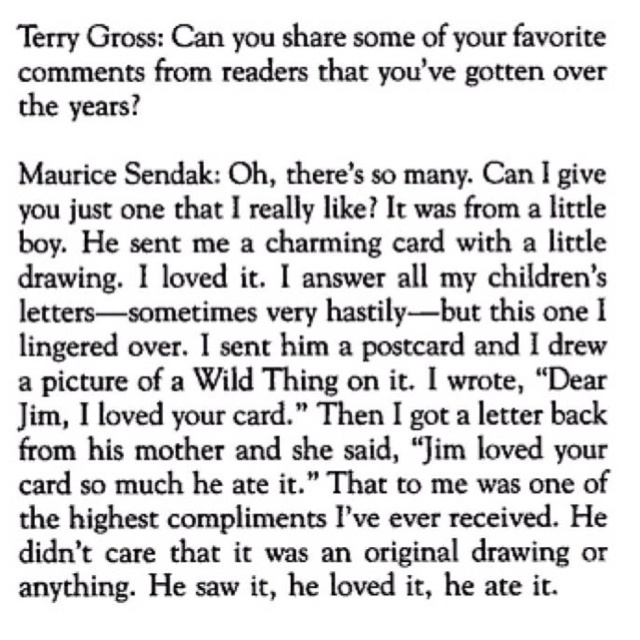 The boy's mother then wrote back to say her son "Jim loved your card so much he ate it," which Sendak considered "one of the highest compliments I've ever received. He didn't care that it was an original drawing or anything. He saw it, he loved it, he ate it."